The Hawaii State VEX Robotics championships will be held tomorrow, bringing together 32 high school teams and their creations to face off on a 12-foot by 12-foot battlefield. Having already reached the finals in dozens of regional tournaments, the winners will have the chance to go onto the VEX Worlds Championship in Louisville, Kentucky, next year. Hawaii school robotics programs have been around for over a decade, spanning a number of different systems: VEX, Botball, FIRST Robotics, FIRST Lego League, Robofest, Underwater ROV, and more. Seen as an engaging, hands-on way to get kids interested in STEM careers, the number of participating schools and teams in Hawaii quadrupled between 2007 and 2010 (fueled in part by strong support from then-Gov. Linda Lingle), with at least 500 teams statewide today. VEX is one of the larger programs. Hawaii hosted an international VEX tournament in 2008, and today, VEX and its elementary- and middle-school counterpart VEX IQ (in which my middle son currently participates) boast more than 240 Hawaii teams between them. 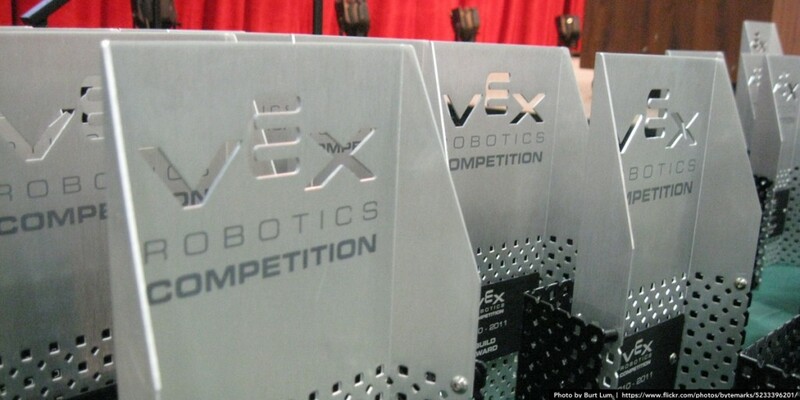 Every year, VEX teams design and build robots to excel in a specific challenge. This year, the playing field design is called “Nothing But Net.” Teams will be paired up into red and blue alliances, working together to score points (and prevent the other alliance from scoring) using 104 balls and a pair of corner goals. You can also score points by lifting a partner robot off the ground, and by deft programming for the 15-second “autonomous period” that kick off each match. Kimura heads the Hawaii Space Grant Consortium, which organizes the competition. The state championships — and the six winning teams that will go on to the world championships — are sponsored by Hawaiian Electric. The Hawaii State VEX Championship will be held tomorrow, Saturday, December 12, at Pearl City High School. The matches will be held in the cafeteria all day, from 8:30 a.m. to 4:30 p.m., with elimination matches starting after lunch and the awards ceremony scheduled for 4 p.m. For more information, visit the event page on RobotEvents.com. Can’t get enough VEX? Tomorrow’s finals are just the first of several: the Hawaii VEX Middle School Championship will be held on January 16, 2016 at Stevenson Middle School, and the Hawaii VEX IQ Championship will be held February 6, 2016 at the Hawaii Convention Center.